My original plans had me viewing the snow covered valley from Grymes Hill at sunrise, but just as I had feared this final open slice of real estate had been fenced off for construction since my last trip there in the fall. I then walked to Wagner college to see if the view from their parking lot overlooking the valley was nice today, but it wasn't all that great. And so with nothing to shoot I climbed up the steep snow covered embankment and headed for the #66 bus that would take me back home and to a nice hot breakfast. But as I cleared the last of the near knee deep snow covered ground onto the shoveled sidewalk, I had a change of heart and decided to cross the icy street to the other side of the road and catch a 66 bus that would take me away from my desired morning repast and head out to Clove Lake instead. I wanted to see what this most recent blizzard turned the sights at the lake into. After plodding rather difficultly through half the heavily snow covered lake with all my gear, I hadn't found a scenic shot in all this snow that warranted pulling my camera out of my backpack. Well time to head home and start cooking that overdue hot meal for breakfast I decided. But curiosity got the best of me one last time, as I had yet to walk near the babbling brook that flowed from the waterfall that runs here year round. I hadn't done so to this point because the snow and snow drifts lining the entire length of the creek was literally up above your waste. Truly it was an unappealing trek to take on an empty stomach. But the possibility that a nice winter scenic shot of the water running betwixt snow covered rocks may lay hidden behind all that snow somewhere, was too hard for my artistic half to ignore, and I made a left turn off the cleared roadway and plowed into the heavy drift. When I reached the snow crested view of the brook, I looked up towards the waterfall off to my right as that would be the most likely spot for a nicely composed scene. 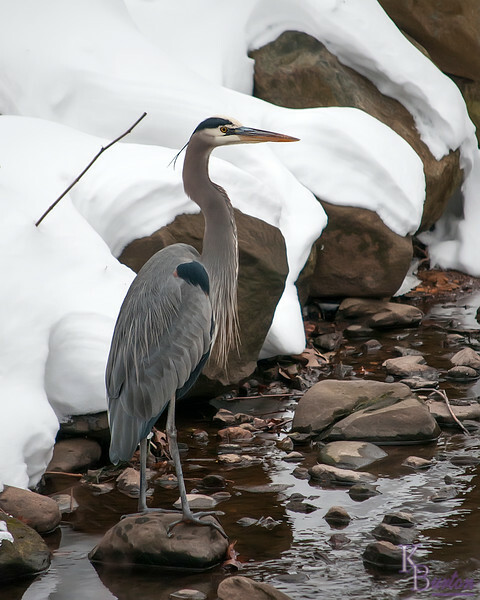 When I did what should I see but this Great blue heron looking back at me, both of us absolutely froze still at the sight of each other. Many of the wild birds here are so used to the joggers and baby carriages going by that they ignore us and continue to hunt for the fish that inhabit the lake instead. Given that the snow drifts were undisturbed as far as the eye could see, it was obvious he wasn't expecting to see any humans this close to his hunting spot this freezing December morning. After a few minutes of standing perfectly still I concluded that he was at least partially tolerant of humans, maybe not as much as some others I had come across here, but if being this close didn't scare him off that was obviously a really good sign. I sloooowly let my tripod bag slide down my arm and disappear into the snow. Then turning my head slightly away from him in an attempt to make it think I was interested in something other than him, I kept one eye as best as I could on him while I wriggled my camera backpack off my body and slipped it slowly around the front of me and gently dropped it at my feet [ wherever my feet were under all this snow :) ]. In a slow, slow dance of motion I pulled out my camera and reached for my longest lens. Unfortunately I packed for a trip to capture scenic shots not wildlife, and the longest thing I had with me was my 55-200mm lens. Small and super lightweight it's almost a freebie to stick in a spare empty bit of space in a packed camera bag. I really wish I had my 300mm and my 1.4x teleconverter with me, but this would have to do, assuming the attempt to slowly lift the camera up to my face didn't send it into flight. If it stayed put even this zoom lens was more than enough to get a frame filling shot. Each movement into my bag and attaching of the lens to camera was separated by long pauses of total motionlessness. When I finally put the camera up to my face I switched the shutter release to it's silent mode, which helps muffle the sound of the camera mirror as you trip the shutter. At this distance any noise like that would kill this opportunity after the first shot. After getting several shots, it cautiously started to walk away form me, and I didn't dare move. Also all this time literally up to my chest in this snow drift had my feet so frozen I couldn't move much anyway. As my increasingly numb fingers reached for my controls I captured a few shots of him as he walked away from me, never totally taking his eye off of me as he did so. Turning around I packed my gear and headed for the bus stop and my warm home. It might be too late to cook a warm breakfast, but it wasn't too late to load these shots into my photo editor and see if any were good enough to eventually make their way into my nature gallery.